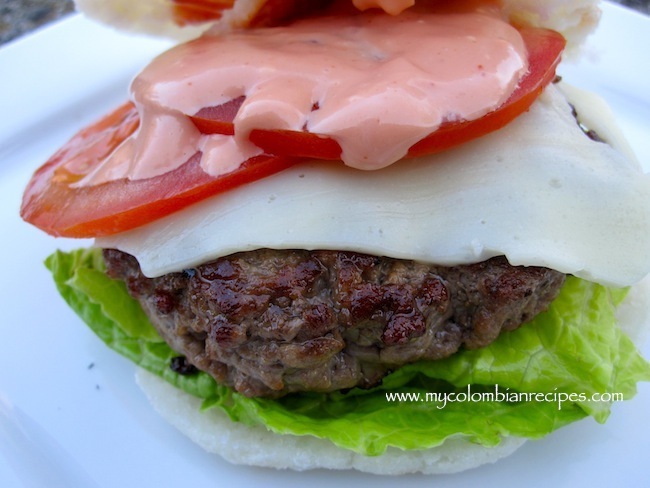 The idea for this Arepa Burger came to me one night while lying in bed, and I could not wait to get up the next day to make it! Arepas are versatile and can pretty much be filled or topped with anything you have on hand. Arepas always come to the rescue when I am hungry and desperate for a quick meal. 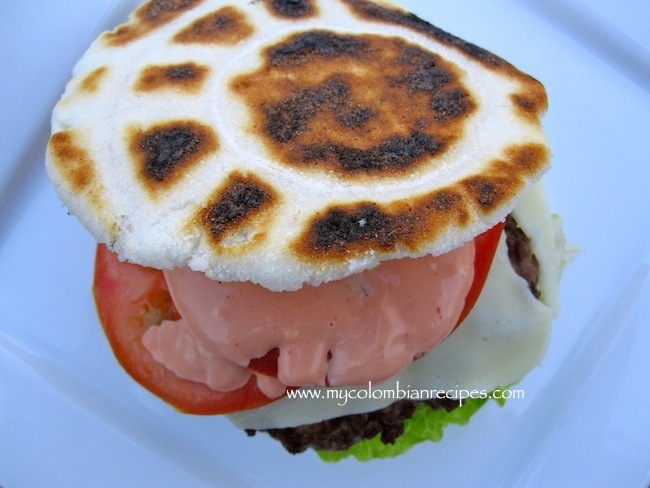 I have created several arepa dishes with various toppings and fillings, but until now, I never thought of using them in a burger. I hope you enjoy this burger as much as I did! In a large bowl add the ground beef, garlic, scallions, onion, cumin, paprika, salt and pepper. Mix well and refrigerate for about 1 hour. Form 4 patties. 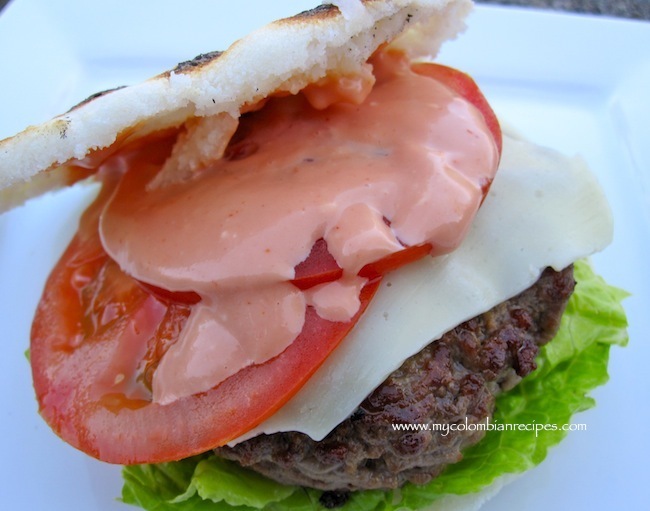 Heat a grill or sauté pan and cook the hamburgers for 5 minutes on each side until done. Remove to a plate and cover with aluminum foil. 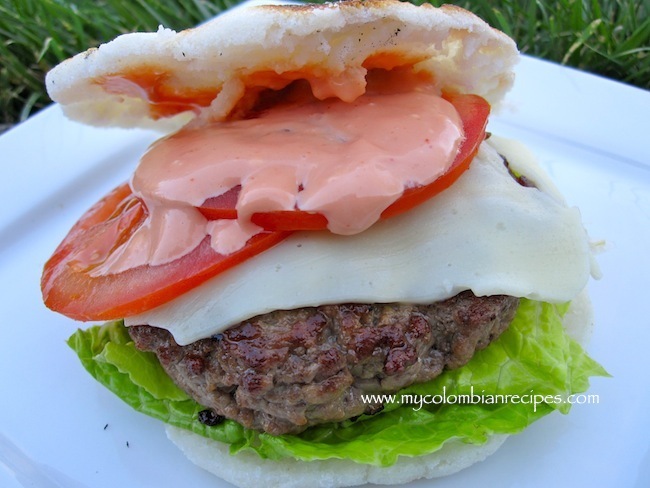 Allow the hamburgers to rest for 5 minutes and serve immediately on arepas with salsa rosada, cheese, lettuce and tomato. Very clever middle-of-the-night thinking, Erica! It’s a super idea. And looks wonderful! A super duper looking burger! Is this even legal? It looks so absolutely delicious! A perfect synergy. there’s not a single thing wrong with this, erica–excellent burger! That burger rocks, Erica. I like that “bun”! I made those for my dad on Sunday, He is from Colombia and loved them. Thank you for all your comments and feedback! 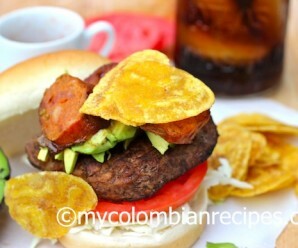 This is a wonderful gluten-free alternative to a traditional hamburger! I’ll try these out this weekend.